As usual I decline any responsibility, if something happen to your computer after having followed this tutorial! 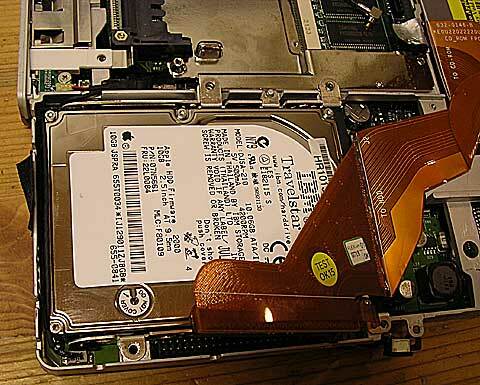 As usual, we shut down the computer, we disconnect the powering and remove the battery. 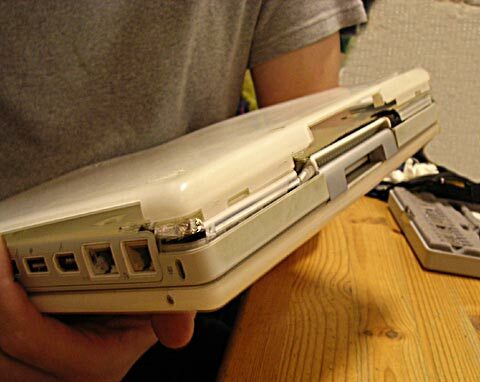 His iBook is a little bit old. Thus, it does not have any more than one of its original feet. They were replaced by felt rounds. They had to be extracted to have access to the Phillips screws (two yellow arrows of right-hand side). The blue arrows point allen screws (size 2mm). 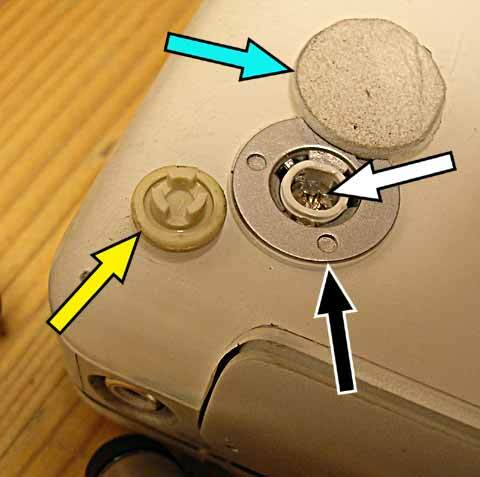 The yellow arrow points a base where the rubber pin, the washer, the support and the screw were removed. The blue yellow points a box intended to recover the withdrawn screws. 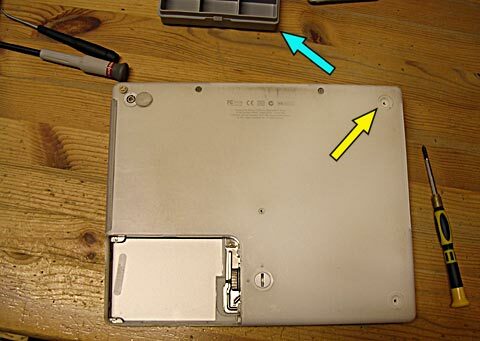 We can now remove the connector of the keyboard (yellow arrow). Never force. Personally, I used a handle on the connector. 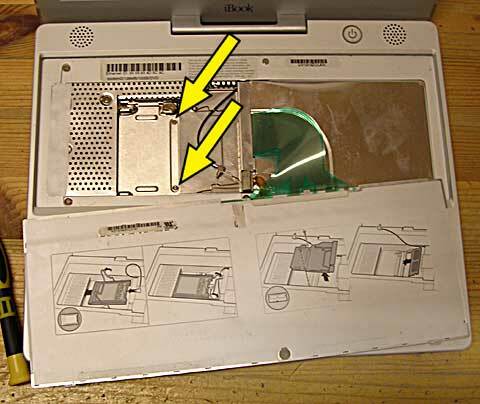 The blue arrow points the connector of the trackpad which also should be taken down. 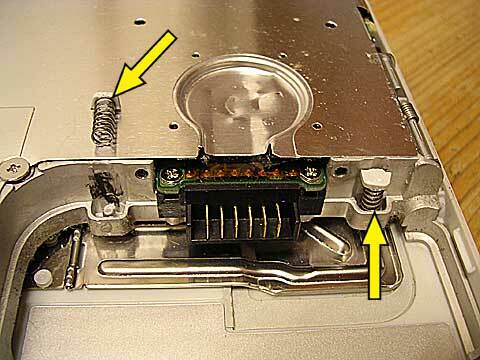 The two last screws to be withdrawn before withdrawing the bottom. It is easier to start from the corner. 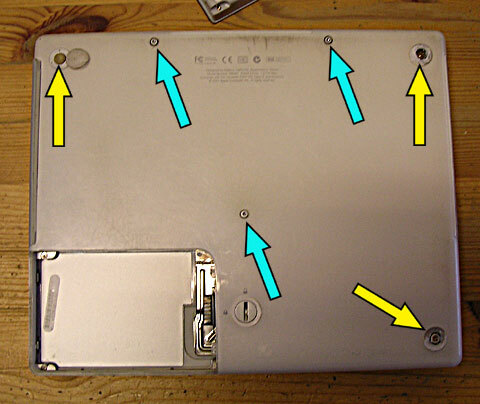 The blue arrows point two clipes of the front face, the yellow points an "internal" clip of the battery compartment. The battery's clip "taken down". Finished. It is necessary to be firm, but do not force. 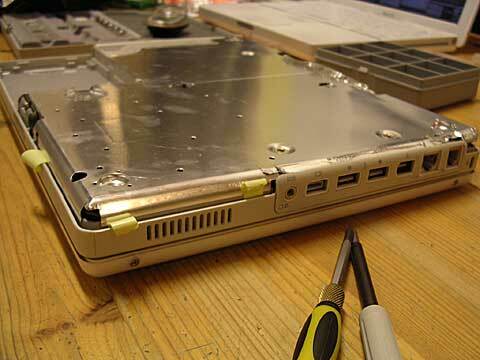 We now see the shielding of the bottom face, considering that we have withdrawn the shell of the bottom part. 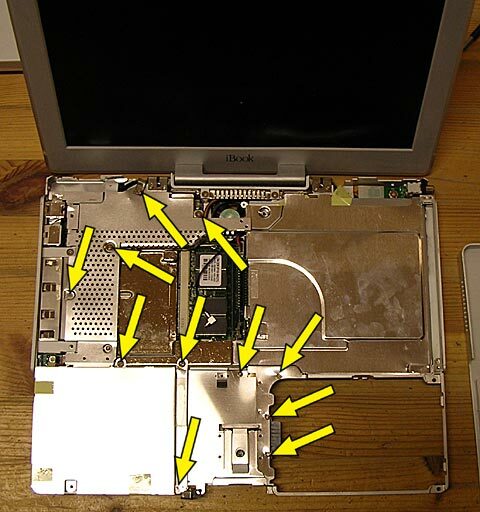 It is necessary to withdraw the screws pointed by the yellow arrows. It's also necessary to take down the stickers pointed by the blue arrows. Caution, do not damage those pointed by the white arrows. 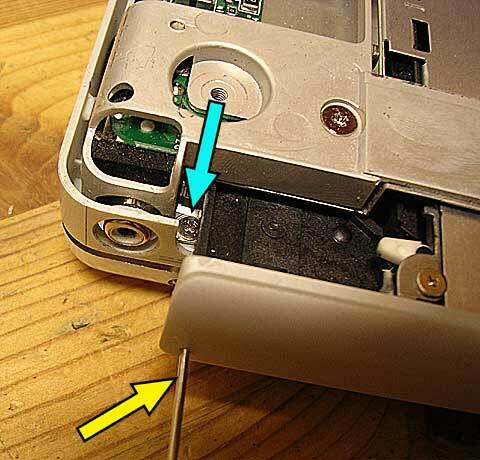 It is necessary to withdraw the springs which fix the battery if you don't want to see them spring and wondering from where they come! 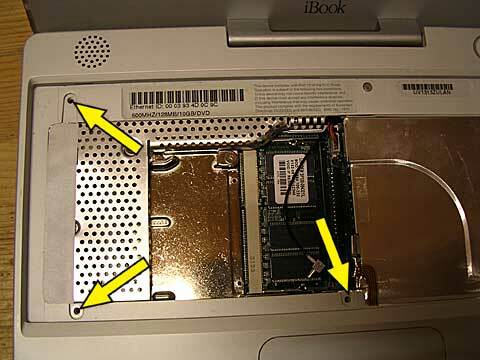 The shielding is almost withdrawn, it is necessary to delicately take down the sticker pointed by the yellow arrow. 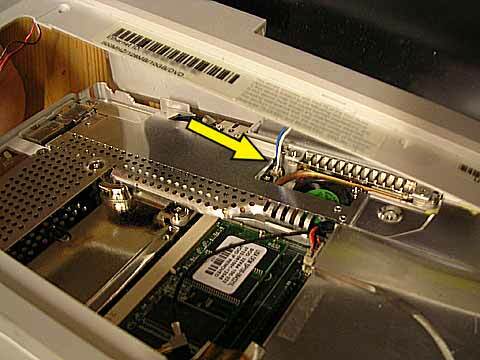 The blue arrow points the ventilator. Yes, there is one the ibooks 500 MHz! 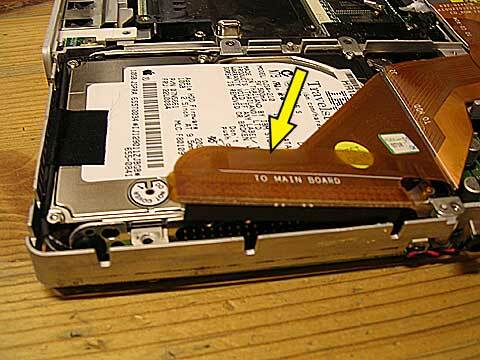 The yellow arrows point 3 screws to absolutely withdraw. The blue point the support of the led. You can also withdraw it but this is not required. 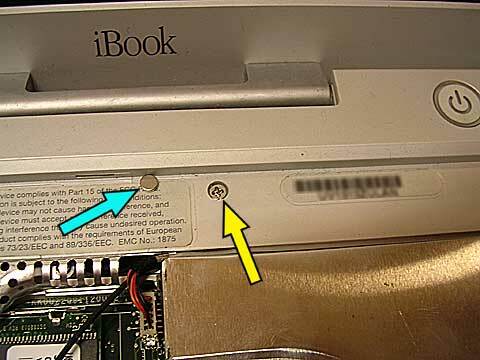 We can now turn over the iBook. We will soon be able to withdraw the top cover, which will give us (finally) access to the disk. And also this one hidden under the magnet pointed by the blue arrow. 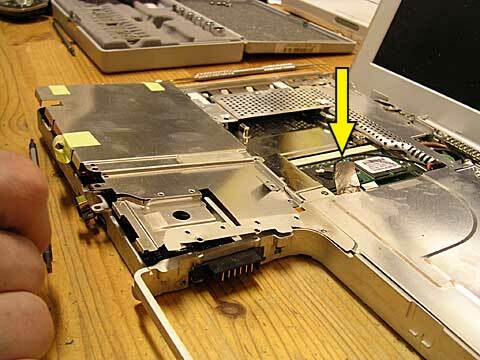 Don't forget to check that the trackpad connector is correctly deconnected. And eventualy, isolate the connector for airport antenna with chaterton. 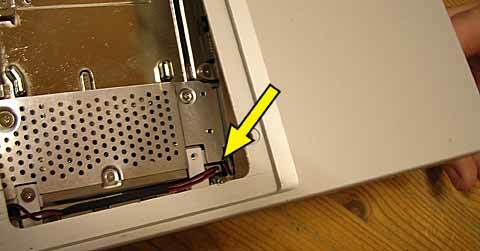 I also removed this screw (blue arrow), hidden by the cd tray which you need to open by using a paper clip (yellow arrow). But I am not sure that this must be done. 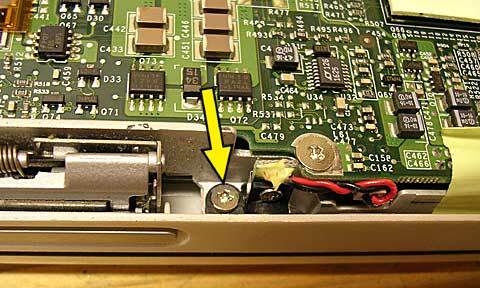 The yellow arrow points the screw maintaining the led -> either we unscrew or we remove the cables. 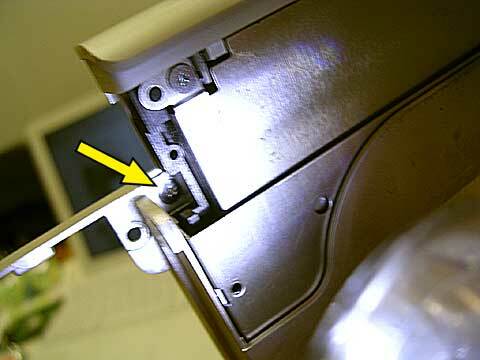 The long screw maintaining the top cover. The speakers cables to be taken down before withdrawing the cover. We also need to taken down the cables of the startup button. Yves C. points out me that resistance to this place is due to the screw of picture 30. And that the magnet which is located there is the one starting the sleeping process. The withdrawn and turned over top cover. There, it begins to become annoying. 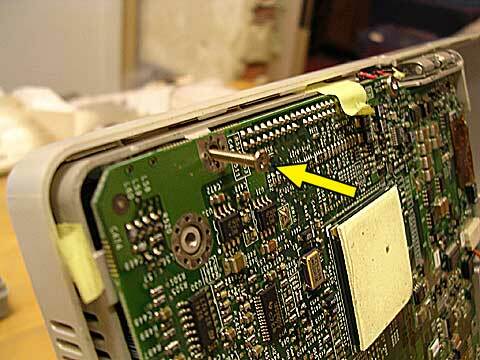 Indeed, all the yellow arrows are pointing all the screws to be withdrawn to be able to take down the top shielding. 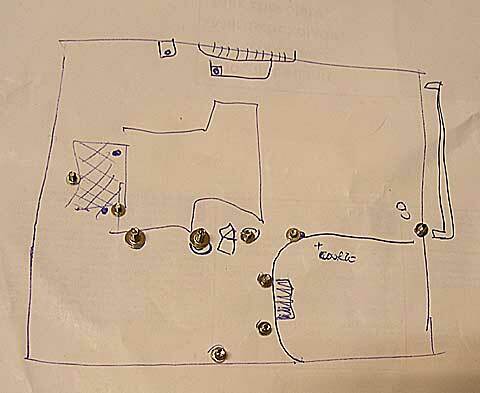 Of course, a lot of the screws are differents :-( -> personally I made a quick plan (ugly) and I put them above progressively in accordance with the work. Well, we finally see the disk! 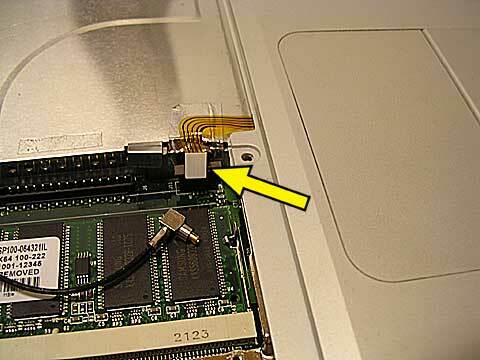 In addition, we also see that there is only one connector for the two ATA drives (the optical drive and the hard drive). 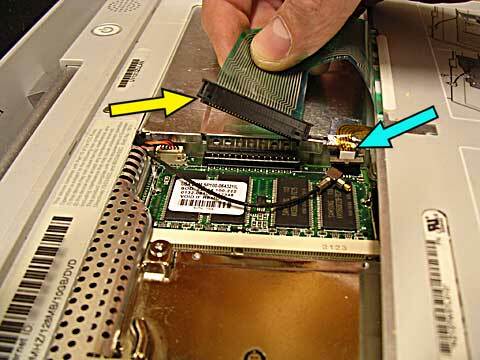 It is necessary to take down the connector of the mother board. There is a "handle". Remember, do not pull too hard, but delicately. A little on the left, then a little on the right, then a little on the left, etc. until the complete release of the disk. If you force, you risk to twist a pin, or worse, to break it. These are the hands of the owner of the iBook! 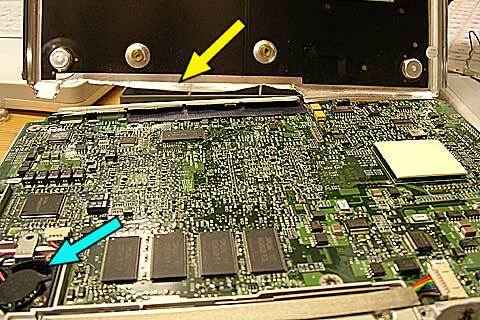 The yellow arrow points the connector to withdraw from the disk, the blue arrow points that there is no video chip at this place of the mother board. This is not what you can read here. Julien Salaün from Canada points out me that the graphics chip is on the other face of the mother board (visible on photograph 16 and 17 under the white thermal patch). -> my natural bad faith pushes me to say that on the other face and in contact with the shielding, I think that it is not enough to heat the machine like that; -) But despite that I thank him for his information! The old one (right). 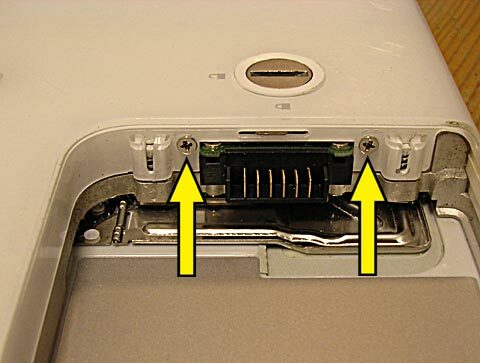 The two parts of the cradle are just plugged in on the 4 studs pointed by the yellow arrows. 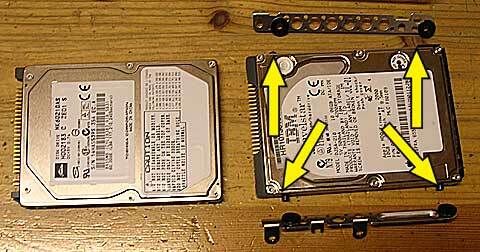 It is necessary to unscrew them and install them on the new disk. 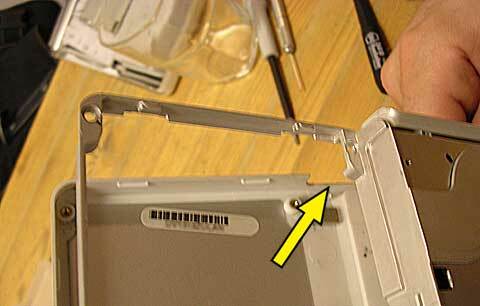 The adequate tool is a screwdriver torx 8. Above, the ugly plan having allowed me to quickly put back the good screws in the good places for the shielding of the top cover. 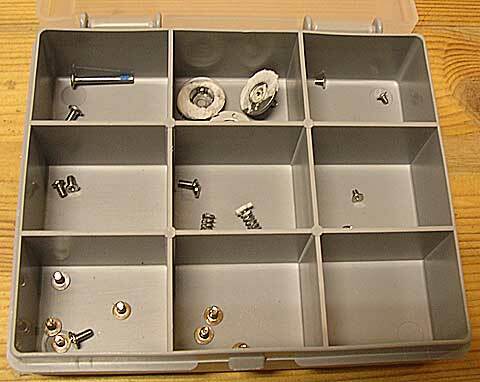 The other screws and parts remained in the box, so I can easily put them back.